Your taste buds take a road trip across our southern states with four delectable flavors. If this nut sampler could talk, it would have a smooth southern twang. But southern accents—like barbecue flavors—have their own unique style. 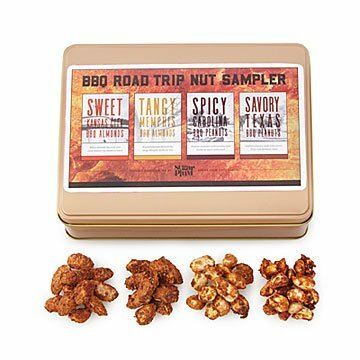 As you snack on this delectable set, your taste buds will road trip across our southern states with four flavors including: Kansas City almonds with notes of smoked salt and sweet molasses; Memphis almonds with garlic, paprika, and tangy tomato; Carolina peanuts with hints of Thai chili, mustard, and malt vinegar; and Texas peanuts with vegetarian Worcestershire, ancho chili, and mesquite smoke. Give them to barbecue aficionados or friends who love to road trip, just don't be surprised when they start saying "Y'all." Handmade by Neil Edley in Pennsylvania. I bought this for my husband to accompany his main birthday gift. The serving size is perfect and the variety of flavors are something different. If you are looking for a small gift or something to accompany a gift this is a perfect choice! Great gift giving idea for the man who has everything. I bought this as a gift for my Dad (to put in a gift basket with coffee treats). I didn't eat any nuts so I can't talk about the taste, however it was perfect for gift giving. It was nicely packaged, with a ribbon. While the quality and taste of the product is good, I couldn't give 5 stars because the value is lacking. Will be using again especially near Christmas. Great idea for a guy!